Oh these cool nights! Fall is here and with that, turning on the oven and baking! I refuse to bake in the summer unless it is an absolute have to event, ie..family wedding, birth, etc..
Now that it is cold enough to turn on the oven, why not fill it with Caffeine and make this cake for you and your loved ones! 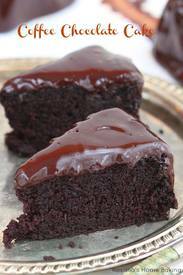 Incredible delicious old-fashion coffee chocolate cake with coffee chocolate ganache made with a secret ingredient that keeps it moist and tender and brings out all the wonderful flavors!